Moshi Monsters - Bobble Bots Bustle! Look at them go! 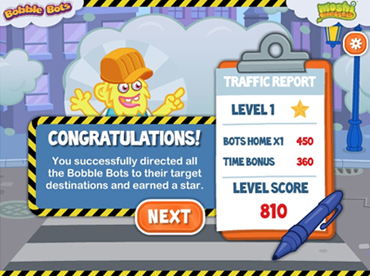 To help promote the launch of the new Bobble Bots toy line from Mind Candy’s Moshi Monsters, the team tucked into making a game that took full advantage of all the wobbly bobbling fun the toys had to offer. It’s your first day as Monstro City’s newest traffic controller. It’s a busy day out there and the Moshlings are all of a bustle – but they never look where they’re going! By moving barriers and planning their routes for them, it’s up to you to direct them safely to their destination. Whether steering Rocky to the Gross-ery Store or Suki Yaki to the Ice Scream parlour, the more levels you get through, the more Moshlings appear and need to be steered. 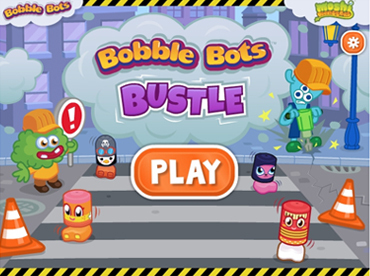 So put your multi-tasking to the test…but make sure you don’t send your Bobble Bot bustling to the wrong place!